The monthly data for world oil production,1 published online by the authoritative United States Energy Information Administration, show that since the middle of 2004 production of conventional crude oil has reached a plateau at an average rate of about 74 million barrels (bbl) per day (see figure). During the past 7 years, production has exceeded that level only in April-May 2005, December 2005, February-March 2008, May-July 2008, and, most recently, July 2010 to February 2011. The highest-ever monthly global production - 75.3 million bbl/day - was achieved in January 2011. This peak was followed by a stage of rapid decline, surely explained by the events following the 'Arab Spring' uprising, particularly the Libyan civil war. 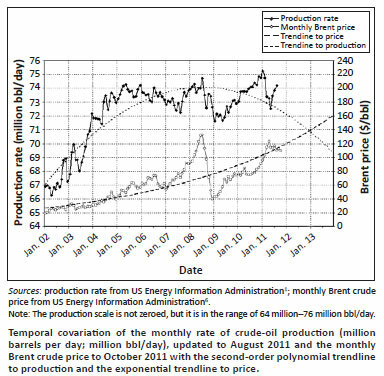 When a second-order polynomial trendline is fitted to the historical production data, the long-foreshadowed Hubbert's Peak2,3,4,5 appears in smoothed form around mid-2008, coincident with the secondary July 2008 summit at 74.7 million bbl/day. When forward-projected over the next few years, this trendline forecasts a decline by June 2013 below 70 million bbl/day, a level which was first surpassed in October 2003. If so realised, the duration of the production peak will thus span a little less than one decade. In fact, the monthly roughness of Hubbert's Peak is considerable, and it is quite possible that there may be a sudden plunge below this level at a sooner time, especially if the current Eurozone economic crisis unravels badly to produce a period of severe recession and 'demand destruction', comparable to or greater than that which occurred between July 2008 and January 2009. Coping with a final peak in world oil production could look pretty similar to what we observed as the economy adapted to the production plateau encountered over 2005-2009. That experience appeared to have much in common with previous historical episodes that resulted from temporary geopolitical conflict, being associated with significant declines in employment and output. If the future decades look like the last 5 years, we are in for a rough time. While a broader group of economists has yet to be persuaded of the imminence of peak oil, a substantial proportion - probably a considerable majority - of informed opinion amongst earth scientists and petroleum engineers holds the view that Hubbert's Peak is a current reality. Willy-nilly, the world is engaged in perhaps the most revolutionary transition in the entire history of human civilisation. Most of the industrial world's institutions - its social organisation, legal system and financial structures - have evolved during the late 19th and 20th centuries, all in an atmosphere of continued exponential growth fuelled mainly by fossil carbon and hydrocarbon resources, amongst which crude oil has a pre-eminent place. The world's inability to increase the global supply of conventional crude oil much beyond current levels poses a problem for continued economic growth. An obvious consequence of the depletion of supplies of conventional, and hence cheap, crude oil, is that an increase in future supply requires exploitation of lower quality, expensive resources, which are economical only at high prices. A system of feedbacks is thus created, leading to what has been described as an 'economic growth paradox: increasing the oil supply to support economic growth will require high oil prices that will undermine that economic growth'10. In the graphical tracking of the monthly covariation of conventional crude-oil production1 and price6 through the remaining part of 2011 and into 2012, the reality of this economic growth paradox is likely to be manifested in the near future. The trendline to the price data is an exponential curve that passed through the $100/bbl level in early 2011.By the end of 2012, it seems set to reach the same level that triggered the 2008 crash. In view of this disconcerting prospect, and failing some remarkable change in how the global economy is managed, it remains to be seen whether the growth era of the past 40 years, to which the world has become accustomed, can continue in the long term. It is notable that Hamilton8 has couched his argument for the relationship between oil prices, resource finitude and economic growth without any reference to the line of thinkers about peak oil stretching back over the last 50 years, including Hubbert2,3,4, Campbell and Laherrere11, and Hirsch12, amongst others. This omission may be necessary in order to make a persuasive case to the academic community of macroeconomists to which he belongs. The failure to give due credit is regrettable, but understandable given the 'enormous walls of incredibility that prevent diffusion of thought between academic disciplines'13.